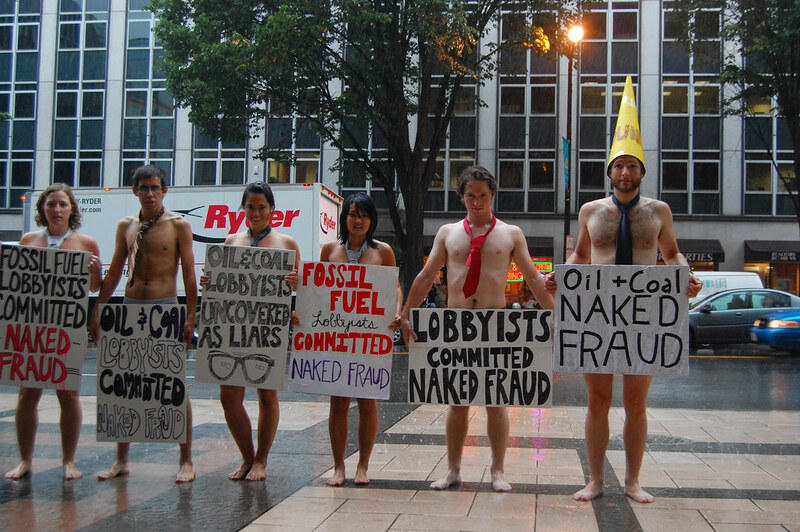 Bonner and Associates pissed us off, so a few of us at the Action Factory, a group of young climate activists living and working in DC, took our clothes off in the rain to demonstrate the NAKED FRAUD of this astroturf lobbying firm. Bonner and associate, who were working for the Hawthorne Group, whom in turn were working for American Coalition for Clean Coal Electricity, forged not 1, not 6, but 12 letters to not 1 but 3 congressmen. All three of these companies are outraged, claiming to have fired the 'deviant' employee who supposedly acted on his or her own. They were so 'outraged' that they didn't notify the congressmen who received these letters. They were so 'outraged' that they even forgot that Bonner has been caught using almost the same tactics before, making them look very stupid for hiring them in the first place. That's pretty much blind with outrage. *We're not legal experts - what are the legal consequences for mail fraud? forging names and signatures? Lying to congress? Also, watch Rachel Maddow's ongoing series on "Unnatural Mail Enhancement"